Khorana performed much of his work while a professor at the University of Wisconsin–Madison from 1960 to 1970, where he also co-directed the Institute for Enzyme Research in the Department of Biochemistry. He shared the 1968 Nobel Prize in Physiology or Medicine with Robert Holley and Marshall Nirenberg for their contributions to decoding the genetic code. The genetic code is a universal cipher, whereby DNA’s famous four letters — A, T, C and G — are transcribed into RNA and then translated, three at a time, into the building blocks of proteins, amino acids. There are 20 amino acids used by cells to build proteins, which go on to do the bulk of the work in a cell. Because every known organism uses almost an identical system for making DNA into amino acids, it is likely that all life on Earth today is descended from a simple cell that used the same system. Biochemist Har Khorana was honored on what would have been his 96th birthday with Google’s daily doodle. 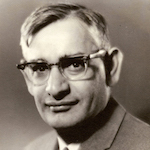 Khorana won the 1968 Nobel Prize for his work at UW–Madison deciphering the universal genetic code. Khorana helped pioneer methods for synthesizing nucleic acids, which helped him and others painstakingly determine how each possible combination of A, T, C and G could ultimately code for a different amino acid. The complete genetic code, and the methods for developing synthetic genes that Khorana developed, helped usher in the modern era of molecular biology where scientists can easily manipulate DNA to answer ever more detailed questions about how cells and organisms function. Aseem Ansari, a professor of biochemistry at UW–Madison, and Ken Shapiro, a professor emeritus of agricultural and applied economics, established the Khorana Scholars Program in 2007 in honor of Khorana and his work. The program facilitates the exchange of top student researchers between India and UW–Madison. Khorana passed away in 2011 in Cambridge, Mass. In 1970 he moved from UW–Madison to the Massachusetts Institute of Technology, where he worked until his retirement in 2007. This story was written by Eric Hamilton of University Communications and was originally published on their UWMadScience blog.